Our vegetables (and weeds) are loving life despite the hot, dry weather. Hannah and Michelle have been hard at work, cycling plants through the garden and sharing abundant deliveries of lettuce, spring onions and herbs to CHD’s Not Bread Alone in Amherst. 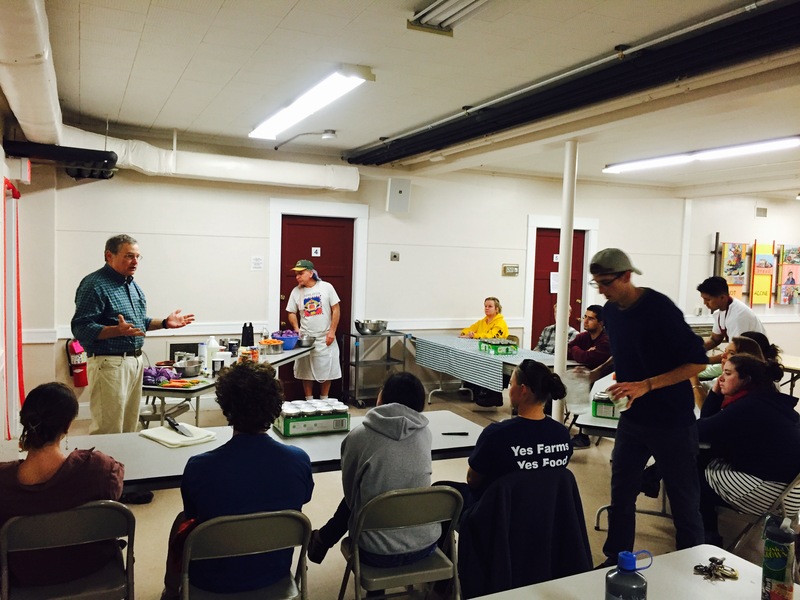 We are grateful for Bob Stover’s committed collaboration with Food For All. To keep up with it all, we’ve reached out to our community members, students, friends and families to join us in our effort to get more fresh food where it needs to go in Amherst. We’ve hosted two of our monthly community workdays and have really appreciated additional helping hands in our garden. Good conversation, laughter, relaxation, and connection with community & nature are all reasons why we keep hosting these events. There is something so satisfying about rescuing a long row of carrots getting taken over by grass. A task that would take 1 person nearly 10 hours can take a small group 45 minutes! Please join us in July & August. STAY TUNED for more updates and announcements of our summer workshops, including a tour of the garden! Spring is here and we are grateful to get growing! 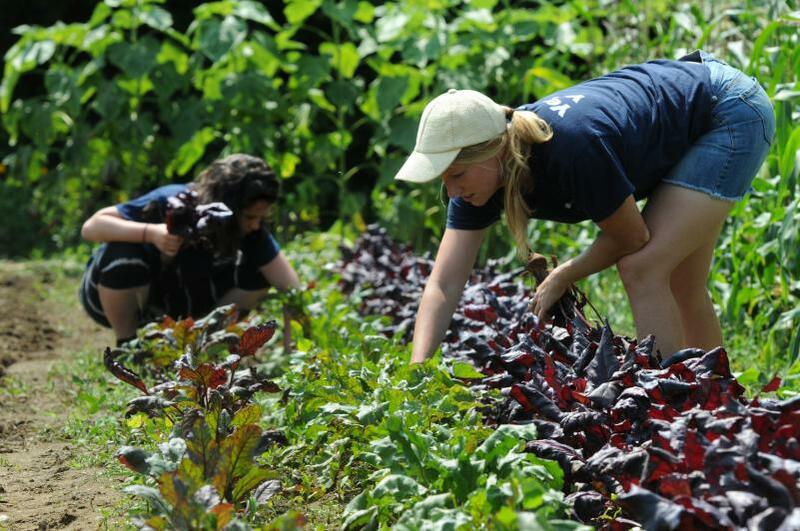 We’ve been getting our hands dirty in both the greenhouse and the field. Spring is the time for PLANTING SEEDS. Ideas, intentions, goals, and these life-filled seeds that will nourish us and our communities in the summer and fall. We are also excited for you to meet Hannah Smalls, our new Student Production Manager at Food For All. 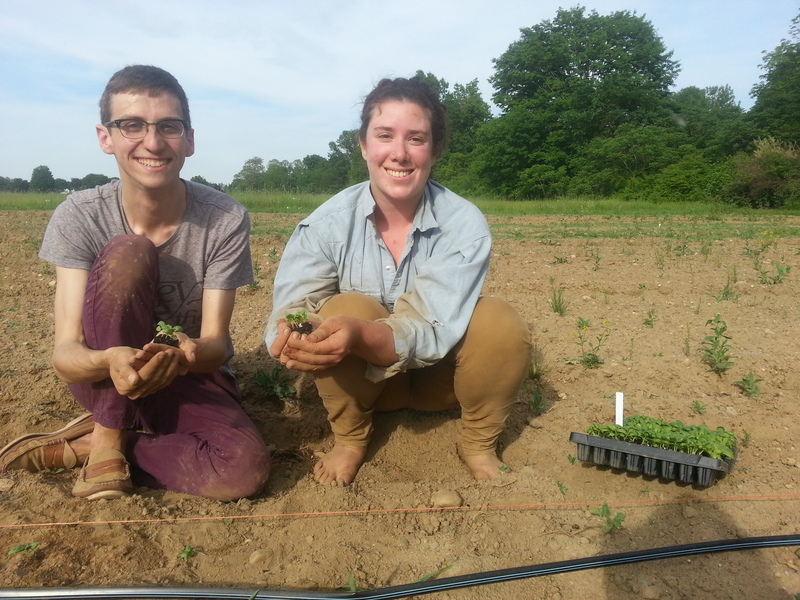 With the leadership and assistance of last year’s manager, Jason DePecol, Hannah has begun seeding, planting, and lovingly caring for our crops this season. Hannah is a UMass Sustainable Food & Farming major. 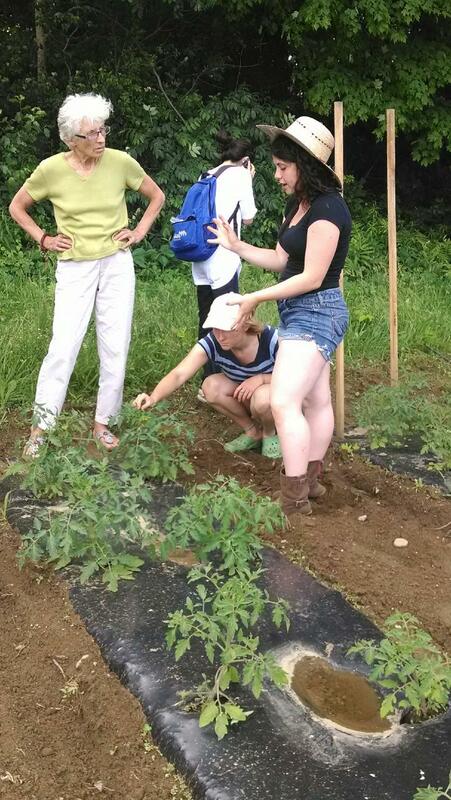 Michelle Nikfarjam, recent Sustainable Food & Farming graduate, will also be on board helping Hannah with our crop production as well as giving tours of the UMass Agricultural Learning Center. 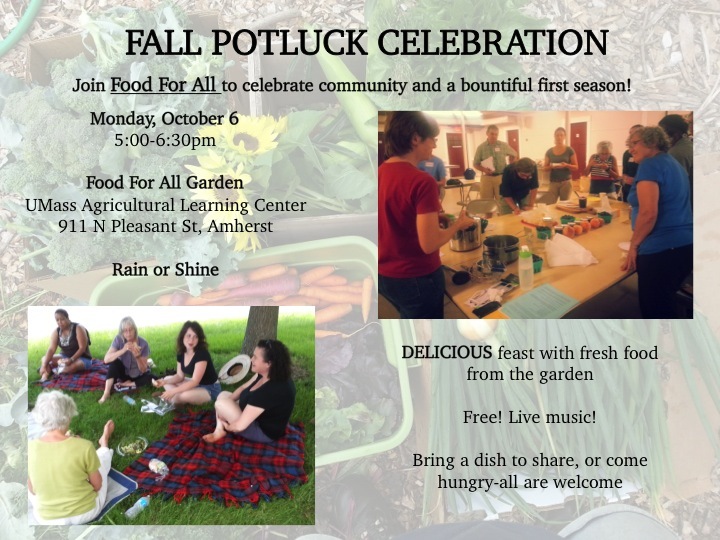 If you have a community group or class that you would like to bring by the garden, please contact us: food4allamherst@gmail.com. 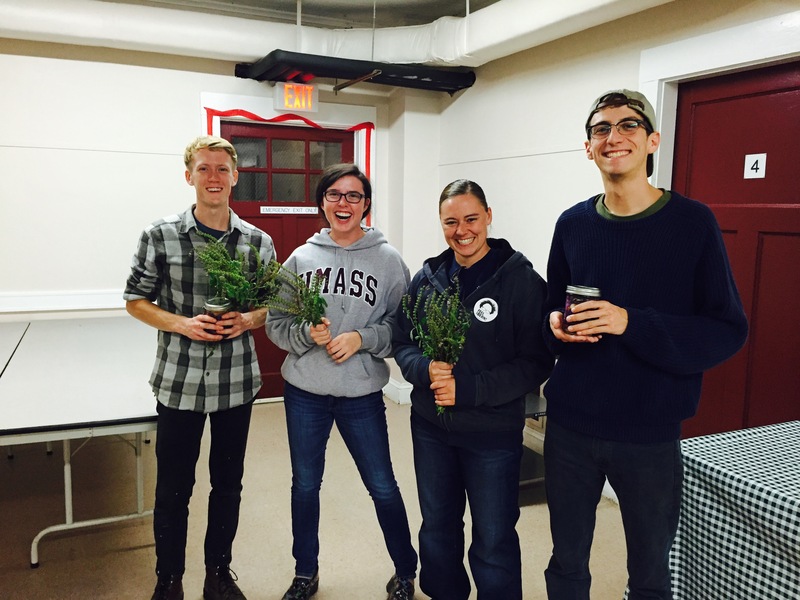 Beyond the field and in the community, Emma Golden, UMass Sustainable Food & Farming student, is our Education Intern this season. She is designing and organizing (free!) community workshops this summer and fall. 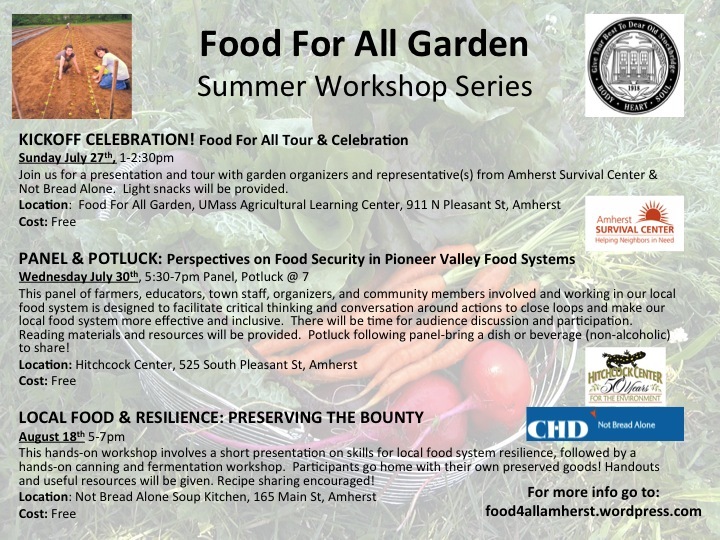 Workshops will take place at CHD’s Not Bread Alone, Amherst Survival Center, and at our garden. STAY TUNED for more info about our summer workshops and workdays. JOIN US for our first Community Workday Monday May 23, 3-5pm to meet our new crew, get your hands dirty transplanting lettuce, kale, broccoli and more. *Workday is RAIN or SHINE but will be canceled for thunderstorms. 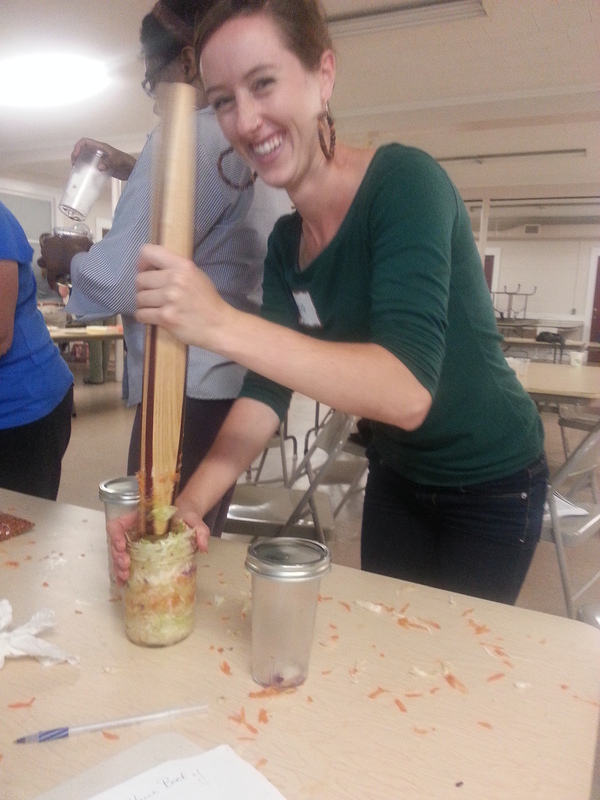 Last month, the Food For All team hosted a fall Fermentation workshop at CHD’s Not Bread Alone , a local community meal program located in the First Congregational Church on Main St. The workshop was a two part community event. Bob, a community member and volunteer at Not Bread Alone presented first, sharing his vast knowledge of pickling. Bob’s pickling process involves vinegar, spices, cucumbers, and the occasional hot pepper. Bob shared how he became involved in pickling, the mistakes he’s made and tips he’s learned with pickling throughout the years–we learned the tricks of the trade and most importantly, got to leave with some beautiful jars of pickles! information on the Pickle Club, a group that feature’s Bob’s passion for pickles to help support and fundraise Not Bread Alone. It was a great example of community members gathering for a great cause! Thanks to both of the Bobs! 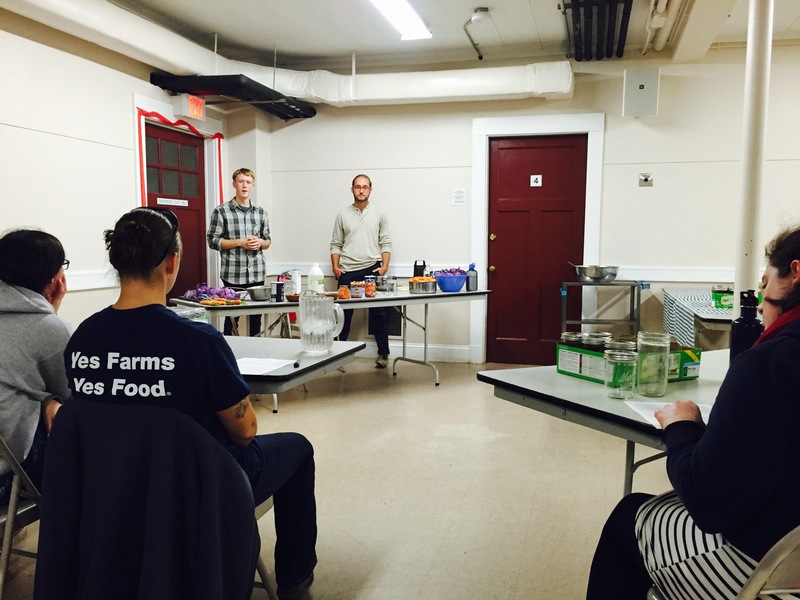 Erik Cullen, a UMass Sustainable Food and Farming Major, and Robert Eastman, a community member and Master Gardener presented on the subject lacto-fermentation. Lacto-fermentation uses bacteria to break down the composition of the food, resulting in food that contains healthy bacteria and that is easier to be digested. The two led a Kimchi demonstration using carrots, red cabbage, and other ingredients, most of which came directly from the Food For All garden! After compacting the vegetables, and adding salt, water, and spices. We sealed jars with a lid to take home, but learned that once home, using an object (like a smaller jar filled with water) to keep the ingredients submerged until they are ready promotes the positive bacteria needed in facto-fermentation. The kimchi will ready to eat within a couple weeks. It was a great hands-on experience that resulted in good food and good laughs! The event reflected the community aspect the Food For All garden strives for. Not only was our event hosted by community members sharing their knowledge and their passion, but audience members, friends of the garden, and the Food For All team added their knowledge that drove the conversation from a workshop to a space to share knowledge and build connections. Thank you to everyone who supported the event! Hope to see you next time! The sun is shining, the birds are singing, and the garden is growing! The Food For All team has been working hard both in and outside the garden. At the garden, food has been coming out and seeds are going in! Our potatoes were pulled and harvested at our last volunteer days. We think about 40 pounds of gold and about 20 pounds of both red and blue potatoes were harvested. This food will find its way to CHD’s Not Bread Alone, The Amherst Survival Center, and community members and volunteers alike. Potatoes are a great crop for us to grow- they’re low maintenance, and can be stored for long periods of time. In place of the potatoes, our garden manager Jason created some raised beds. In its place were planning to plant some late season crops: lettuce, carrots, beets, and broccoli. Come join us at volunteer hours to help put some of these in the ground! Our last one (for the summer season, at least) is August 25th 10am-12pm. In the next coming days and weeks, we’ll be doing a couple things. First, our carrots are nearly ready to come out of the ground- hopefully within the next coming days! We have three beds of carrots each holding three rows. In addition, our onions are also ready to come out of the ground! Our smaller variety of onions still need a couple weeks to mature. We also have a large amount of kale at the far end of the garden bursting with leaves and ready to be harvested! This season we grew two kinds of varieties, including Red Russian and the classic Green Curly. 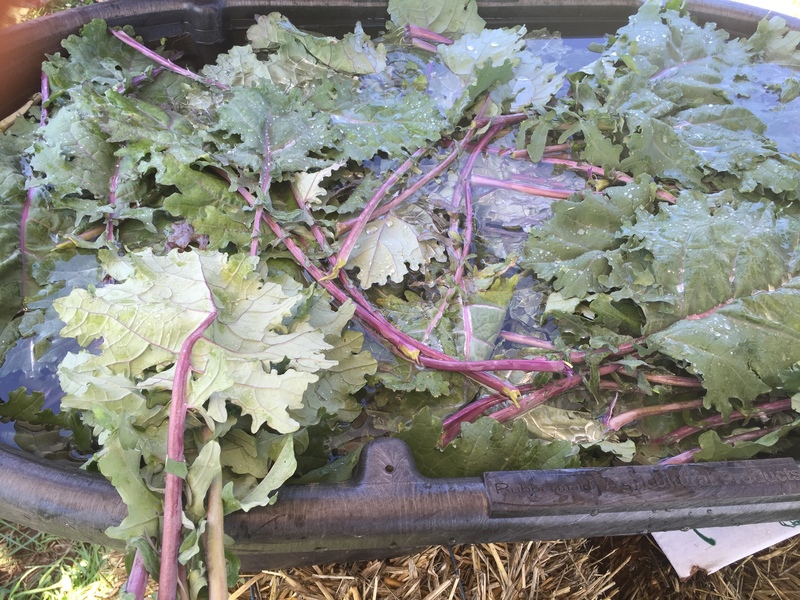 Our kale plants will continue to grow well into the fall, and can even withstand some snow. Our sunflowers are blooming, our herbs, including Thyme, Basil, and Sage are growing steadily, and the garden bursts with more life everyday! Outside of food production, the Food For All team has been hosting and planning some different community activities. weed our garden, while also participating in a discussion with the Western Mass Food Bank about food policy and food security. Volunteer days have been successful with good company and good snacks, and the Food For All team continues to meet and ruminate over new ideas. for the food banks and kitchens in our community. The season is flying by and we’ve been busy planning and planting the garden with crops for our second season. 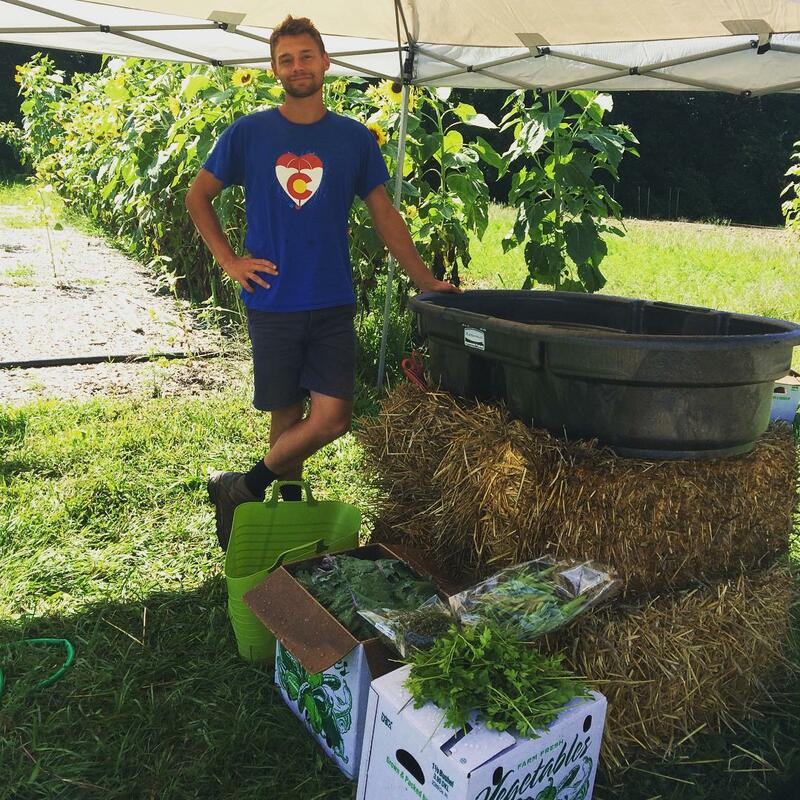 This year, UMass Sustainable Food and Farming student Jason DePecol, has taken over as Production Manager of Food For All Gardens. We are grateful to have him on board! In just one month he has filled the garden with food (with the help of friends, fellow students, and community members)! This year, we are hosting VOLUNTEER WORKDAYS every other week on Tuesdays and Fridays 10am-12pm. Our next one is THIS FRIDAY June 19th. During our first two workdays, we put a call out to the community and were delighted to have help from local community members, students and friends. We planted TONS of onions, shared good conversation and enjoyed some iced tea and snacks together. We learned a lot in our first season and are excited to work even more closely with CHD’s Not Bread Alone and Amherst Survival Center this year to fulfill our mission of growing food with and for these community centers as well as providing meaningful community education opportunities. Plus, we are excited to enjoy some deeee-licious meals at both places that feature our food! Brian Horrocks and Emma Golden, both UMass students, are helping as community education leaders this season. We are excited to continue with our workshops this summer and are working with Not Bread Alone and Amherst Survival Center to complement meal times and other community events. STAY TUNED for more details about our workshops. We are calling all community members…WE NEED YOUR HELP to make this happen! Join us for a volunteer day and help spread the word. We’re located at 911 North Pleasant Street in Amherst. 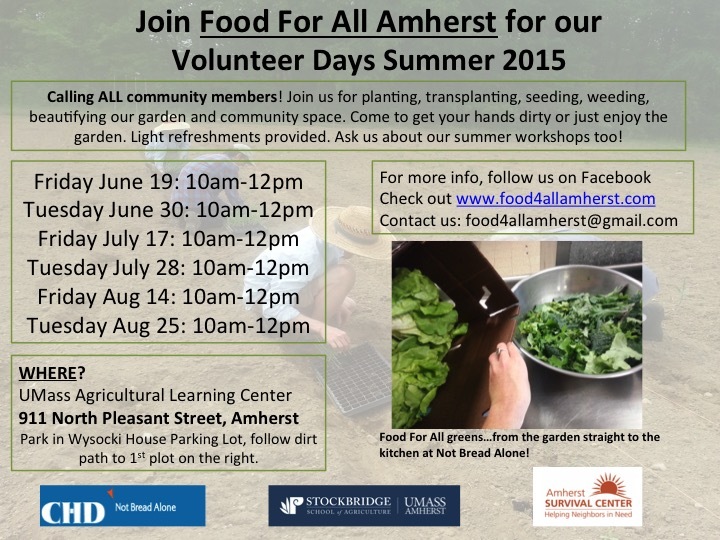 If you’d like to get involved or be added to our mailing list, contact us: food4allamherst@gmail.com. JOIN US FOR FUN FALL TIMES! The last month has sure been abundant with veggies to harvest and deliver…so bounteous that we are working on PRESERVING them! 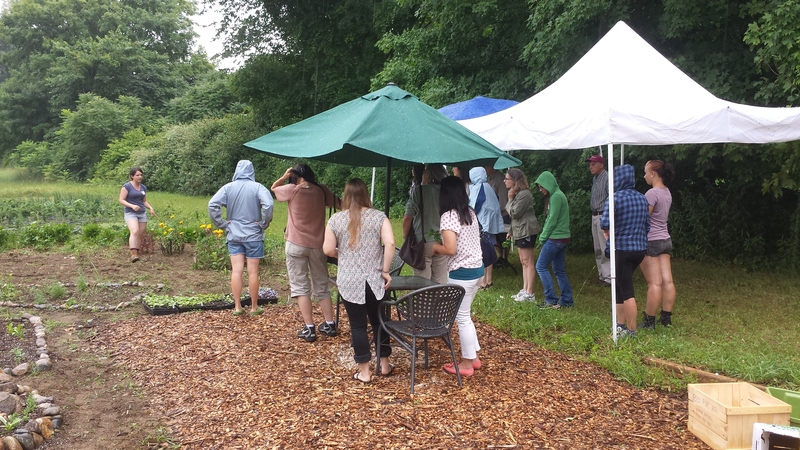 In July we kicked off our Workshop Series with a tour, where community members were so interested and enthused, they joined us in the rain for a tour! The conversation continued with a PANEL AND POTLUCK held at the Hitchcock Center for the Environment. In our discussion we were joined by some local wisdom and experience. Mindy Domb (Amherst Survival Center), Sara Tower (New Lands Farm), Jonathan Surrency (Nuestras Raices), and Lisa Damon (Massachusetts Farm to School) discussed their greatest inspirations and struggles in their work in our local food system. 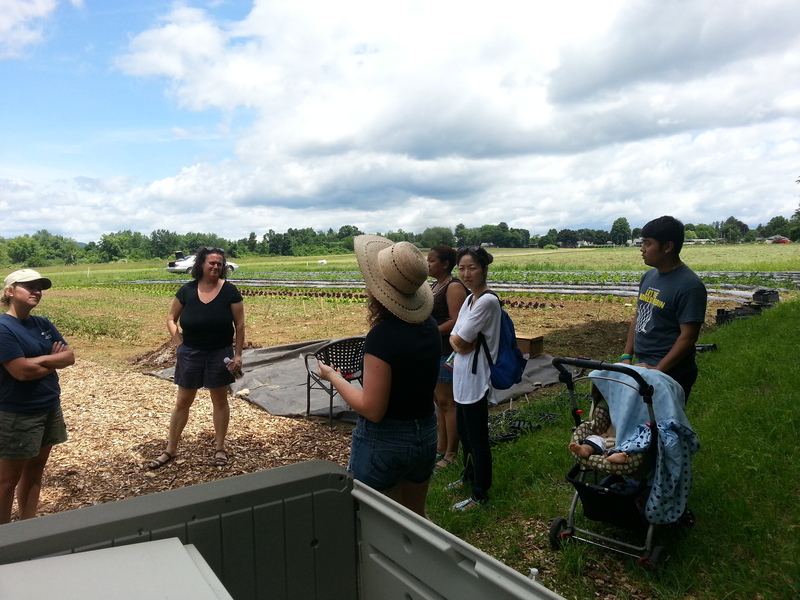 With a focus on action, we discussed how any community member can get involved to improve their local food system. The conversation was followed by some feasting with a DELICIOUS potluck. The Hitchcock Center was buzzing with excitement, community connection, and good conversation. 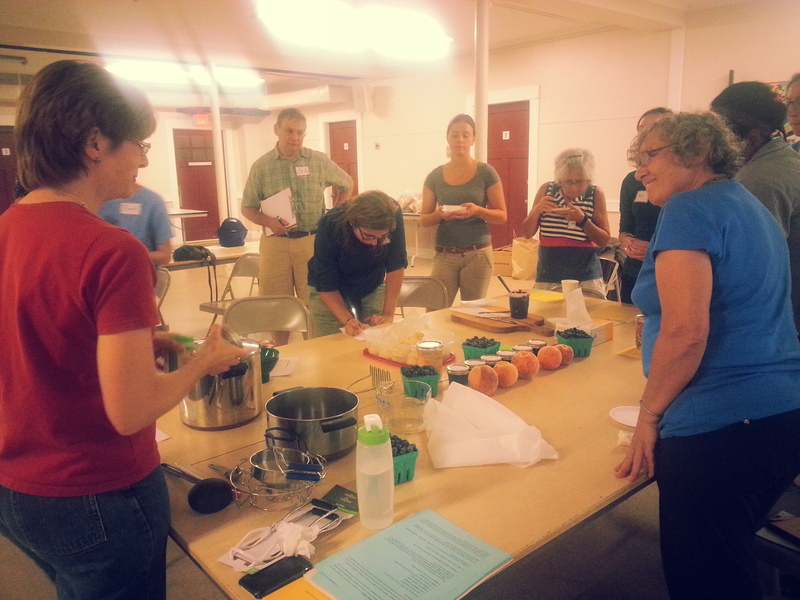 The fun continued on Monday August 18th with our PRESERVING THE HARVEST workshop at CHD’s Not Bread Alone. Bob Stover, NBA Program Supervisor, welcomed us hosted the event in their space. There were 3 stations: pesto making (led by Sarah Berquist), jam making (Peg Thibbitts of Harvest Market), and Fermentation Station( Costa Boutsikaris and Erin Ferrentino). All who attended got to taste some locally made preserved goodness and then make some to take home! Recipes, ideas, do’s and don’t’s, and laughs were shared. This month we’ve been grateful to receive some new faces as volunteers. The Hampshire Gazzette wrote a lovely article about our project, you can see it here. Our current volunteer times Tues and Thurs 9-12 and Weds 11-2 will be shifting slightly come September-stay tuned! Until then, join us and bask in the bounty and beauty of August! THANK YOU to all our community agencies who help make it happen, volunteers, community members and friends for your support! In spite of a blast of July thunderstorms and strong sun-showers, a wonderful handful of community members joined us for our Kickoff Celebration at the Food For All Garden yesterday. Our hope was to bring in some new faces to the garden and celebrate its gorgeous growth. We began by gathering over some garden-fresh snacks and local iced tea (thanks to Bajrang Teas!) and snuck in a rapid tour of the gardens with Cate before the rain washed us out. Continuing the conversation indoors, we heard from representatives of the Amherst Survival Center and Not Bread Alone about how these organizations operate. One of the most exciting aspects of our work is the seemingly boundless POTENTIAL. These organizations do more than provide food to people..they make Amherst and the Pioneer Valley a place to call home by cultivating community. Beyond the food donated are the conversations shared over the food, the friendships made and sense of place and belonging provided by being a part of a loving community. We are excited to continue the conversation, please join us for our PANEL where we will dive into some of these issues hearing from a diverse representation of local food systems experts. 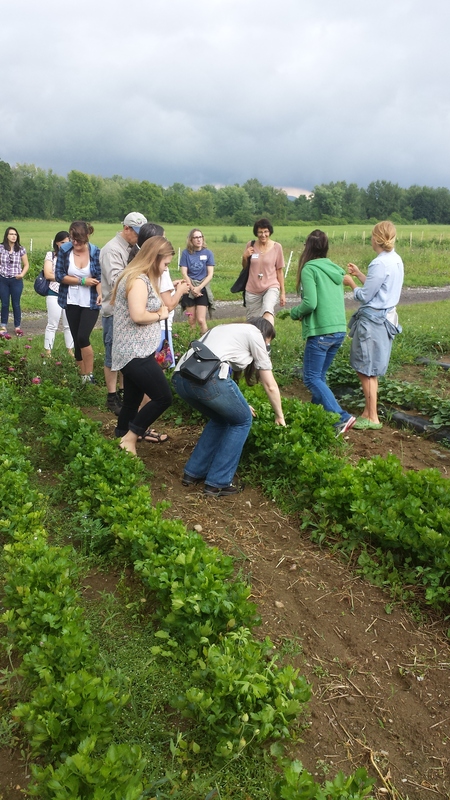 Last week, the Amherst Survival Center had their first field trip to the Food For All Garden. Cate and Sarah gave a short tour, explained the history and goals of the project and eagerly heard suggestions in how to continue to improve our work. The tour was followed by a delicious picnic with yummy sandwiches and cold drinks provided by Tracey from Amherst Survival Center. Since this project is still very young in its first season, we every day we are trying new experiments, observing, and refining and so the cycle goes. It was exciting to have a nice handful of Amherst Survival Center community members present at our event and celebrate how the plants are finally growing! Our mission is to provide not only food but also education and opportunity to our community, our volunteer hour s strive to offer a chance for someone who perhaps may not have a garden or just wants to spend some time working with plants. Our tasks and work range from the ordinary farm tasks to planting apple trees, making herb spirals, and more! We are excited for this farm-garden fusion to deepen its roots in the community and want your help and ideas! Join us! Tuesdays & Thursdays 9-12 and Wednesdays 11-2. All are welcome to come for any or all of the volunteer time, and if you’d like to schedule an alternate time food4allamherst@gmail.com. Also, SAVE THE DATES our summer workshop series starts SOON! See our EVENTS page! Volunteer & Join the Fun! We are excited to be getting all our transplants in the ground and begin to watch them GROW GROW GROW. After enjoying a delicious meal at Amherst Survival Center, we’re looking forward to filling their meals and distribution with some more delicious organic veggies. Want to join us? Our VOLUNTEER HOURS are Tuesdays & Thursdays 9-12 and Wednesdays 11-2. Bring a friend and spread the word! 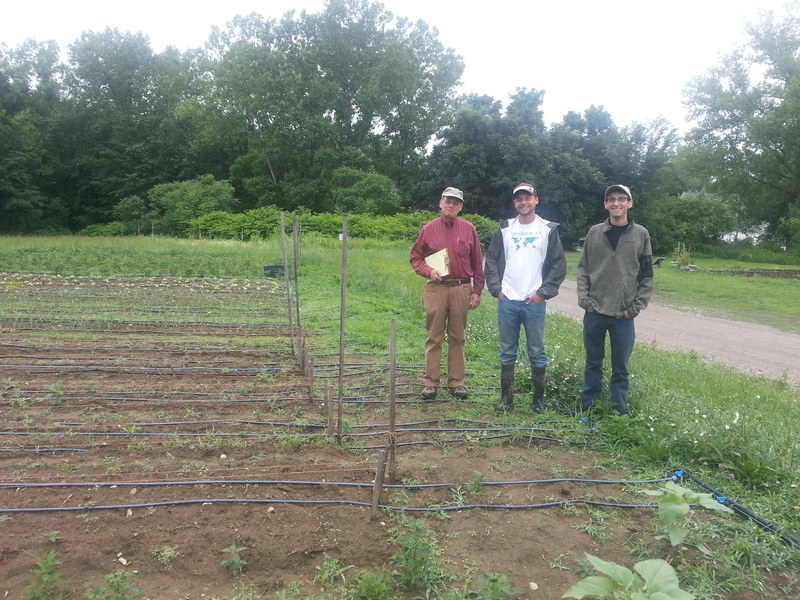 We are located in a field behind the Wysocki House at the UMass Agricultural Learning Center. Food For All is not visible from the road but is easy to access. Wysocki House is on your Right–911 North Pleasant Street. -The Wysocki House is on your left. miles. Food For All is the first plot to your right. Food For All is accessible by PVTA Bus Routes 30, 31, and 32. SEE YOU THERE! Contact us food4allamherst@gmail.com with questions!